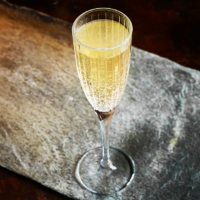 Nutty brown-butter-infused vodka is the perfect way to spruce up your festive fizz. 1. For the butter liqueur, gently heat the butter in a small pan for about 3-4 minutes, until it turns golden brown. Put the vodka in a clean, sealable and heatproof container. Carefully add the warm butter to the vodka (it may spit) and seal tightly. Store in the fridge until the butter re-solidifi es (about 2 hours). 2. Put a coffee fi lter in a sieve and strain the mixture – don’t try to push the butter through; discard the butter. Add the sugar to the liquid and stir to dissolve. Transfer to a cool, sterilised bottle and store in the fridge for up to 1 month. 3. For each serving, pour 15ml butter liqueur into a champagne flute and top up with 100ml champagne (or sparkling wine), stirring gently, if needed.